James Haded and Chris Litchfield were a tough combo against Wakefield. Tournament play began at BHS this afternoon with an exciting 11-10 win over Wakefield. It was the first post season lacrosse win for BHS in school history. 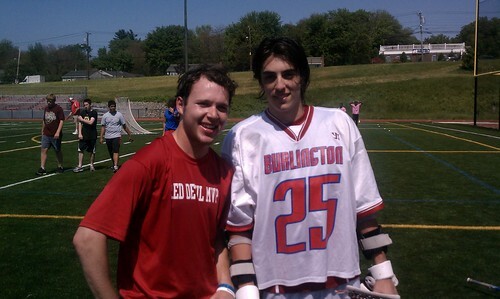 Senior James Haded and junior Chris Litchfield led the way offensively with four and three goals respectively. The Red Devils, who improved to 11-8 with the win, will travel to top-seeded Wellesley for a 5 p.m. matchup on Thursday. Wow!! Congratulations, BHS Lacrosse!! You've been working incredibly hard!! That's awesome!! Keep up the great work. Good luck tomorrow! !